The Monsal Trail 10 km race report. 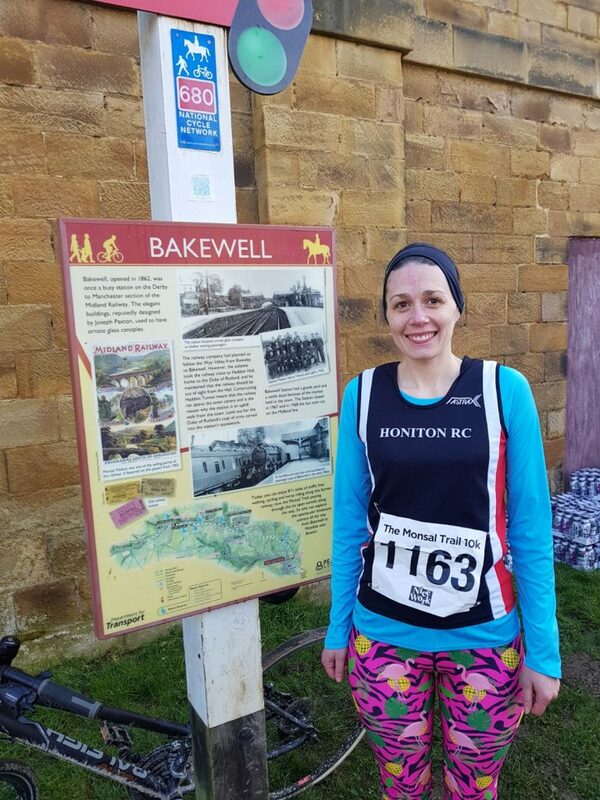 Sunday saw me running the Monsal Trail 10 km in Bakewell in Derbyshire, I must have been mad as it was the day after a friends wedding plus the clocks went forward so we lost an hours sleep. I did feel slightly tired on Sunday morning but better than I though I would, I think I must have had 4.5 ish hours of sleep because of the clocks going forward. Bakewell was about 30 minutes from our hotel and we arrived just after 9.15 am so plenty of time before the race. This was just as well as it was a 5 minute walk from the car to HQ and there was a long long Que for the 5 porta loos which took me 15 minutes to get to the front. The HQ and the start of the race it at the old railway station and here there was Big Bobble hat company selling there hats, you could collect your pre ordered or buy this years and last years race t shirts and there was pre and post massage. The 10 km race runs alongside a half marathon and both races happen on the Saturday as well as the Sunday, this is because the trail is still open to the public so the race numbers are limited. The half marathon runners set of about 5 minutes before us and there were double the number of runners compared to the 10 km runners. Both races are an out and back route with tunnels to go through. Because I did feel tired I settled in to the first couple of kilometers and took it at an easy pace as I did not want to get to 6/7 kilometers and my legs give up. At the end of the first mile we pass a cafe and here there were lots of supporters and people just sat outside of the cafe cheering us along which was nice. I knew that this cafe would be important on the run back to the finish. I did start to increase my pace as I it the 4 km marker as I felt OK and I wanted to get to the half way point. The half way point was inside this huge disused tunnel which was really cool to experience this, as I got to the 5 km sign a marshal shouted at me to turn around, so I promptly put on the brakes and did a swift turn. As I went in to the tunnel I did count the number of female runners that passed me on their way out of the tunnel and heading back to the finish, and I thought I was in 6th. I was still increasing my pace as I came out of the tunnel in to bright sunshine, (I did not pack my shades) and in the far distance I could see another female runner in the distance and this was my aim, to over take her to be in the top 5. As I was approaching this runner I was thinking about tactics, do I stay behind her and wait to over take her nearer to the finish? Or do I overtake her now, stick to my pace and hope I am faster than her or she tires? The decision at about 7 km was taken out of my control as I found that If I stuck behind her I would have to slow my pace, so I over took her and we exchanged pleasantries. Again I increased my pace again at 8 km and was just aiming to run past the cafe again and just kick for the last mile and hold on. It was lovely to have people outside of the cafe cheering and that really spured me on and as I ran on from the cafe I could hear the cheers for the lady I over took so I knew she was close. As I passed fellow walkers I must have sounded like a train because I was breathing so deeply, especially in the last km which always seems so long. As we turned a slight bend I could see the finish and I was ready to die but I did kick again which was painful. As I crossed the finish line I was informed I was 4th female which is amazing and clearly I can’t count. I also smashed my time from Barcelona and crossed the line in 51.33 minutes. I was 12th/64 runners, 4th/48 females and 4th/10 female vet 35-39. My watch did not bleep with a record as my distance was 6.18 km’s because I lost GPS in the tunnel. The race starter did say that this would happen but the course is 10 km. I would have run those last meters but I do not think my legs would have liked it. The out and back route follows the old railway line and it is flat and picturesque. It is trail but you could easily wear road trainers as it was a gravel path with a few puddles. You go under a number of bridges and the half way point is in a big tunnel which is cool and then you turn around and head back to the finish. You get a lovely bespoke medal with the design of the trail on it with a tunnel on it, an actual hole. The only downside is that the 10 km runners get given the same medal as the half marathon runners. 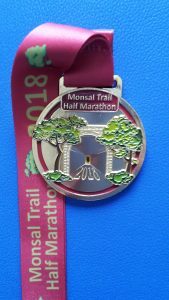 So on the actual metal disc it says Monsal Trail half and then again on the ribbon. 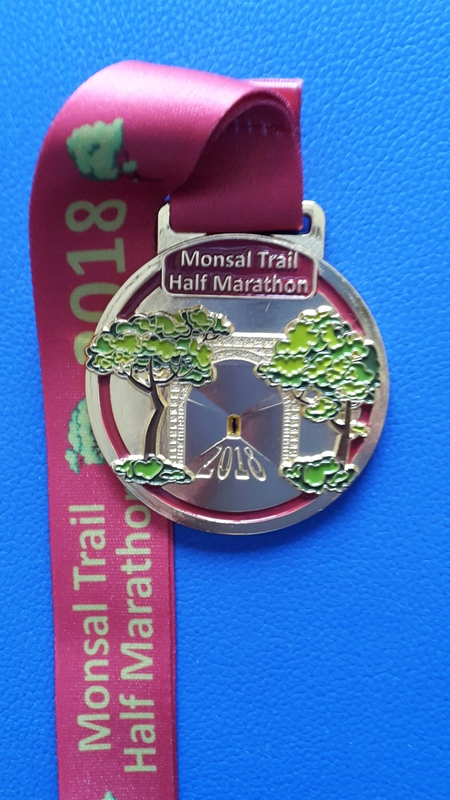 This could be easily rectified by removing the ‘half’ word from the metal disc and having a different ribbon for the two races or have the same ribbon but it just says Monsal Trail. You could pay extra for a t shirt which you collected on race day, it worked out to be £8 for the t shirt. I did see the t shirts and they were of a technical fabric and the great design was the same as the medal. It was better design and colour of last years t shirts which they were also selling at a reduced rate. Due the the fact that the t shirt was the same design as the medal it only said half marathon on it so again not suitable for the 10 km runners. The organisation on the day was good, with the small amount of runners there wasn’t much organisation that was needed. There was plenty of signs for car parking and signs directing you to HQ from the entrance to the town. They were regular posts on social media on the Monsal Trail page and on the organisers page-Nice Work. The regular posts in the week leading up to the race including photographs of the route helped you to get excited for the race. If you were racing on the Sunday like I did, then i enjoyed seeing the photographs that they posted from the Saturday races. They posted with the links for the photographs and race results by the end of race day. Yes I would recommend it, it is reasonably priced (£16/£18), a great completely flat route and definitely a PB course. I can’t say for the half marathon but in the 10 km you will have to prepared to be by yourself at some points and that is a challenge. If they sort out the medal issue then this would be the icing on the cake.